Richmond Retirement Community for active adults, featuring villa floor plans, opens in June, 2014. 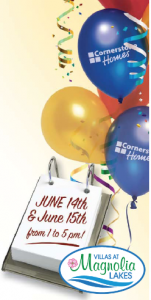 SAVE THE DATE – June 14th & 15th from 1 to 5 pm! Cornerstone Homes, LLC, is proud to announce it has purchased The Pointe at Magnolia Lakes. Now known as Villas at Magnolia Lakes, the community will feature “villa-style” floorplans that are high on luxury, and low on maintenance. Cornerstone will also be upgrading the community’s amenities, like the clubhouse, pool, fishing lake and outdoor fireplace area. Please join us on June 14th and 15th as we celebrate the Grand Opening of our new Villas at Magnolia Lakes sales office, and introduce our innovative maintenance-free single story Villa floor plans. Meet our sales staff, as well as the president of Cornerstone Homes and the vice president of construction, while you mingle with current homeowners and enjoy light refreshments. Tour the clubhouse and pool areas, and explore what life is like at Villas at Magnolia Lakes. Combined with low interest rates and a terrific location, you won’t find anything else like Villas at Magnolia Lakes! After May 19th, if you’d like more information about Villas at Magnolia Lakes, contact Sales Consultant, Ginny Prudhoe at 804-726-4310.